Still possessing a mathematical chance at the 2011 NASCAR Sprint Cup Series championship, Matt Kenseth emerged from Saturday's qualifying with the Kobalt Tools 500 pole position. Kenseth steered his #17 Roush Fenway Racing Ford around the newly-paved Phoenix International Raceway with a lead time of a 26.26 seconds averaging 137.10 miles per hour. A tad slower than teammate Carl Edward's spring qualifying benchmark, Matt Kenseth's time is the quickest run achieved during a late fall event at the one-mile Phoenix oval. Allowing Ford's blue oval to shine with supremacy from the start of Sunday's NASCAR Sprint Cup race, AJ Allmendinger lapped the race track at 26.38 seconds. Ford Fusions swept the top three positions with the second Richard Petty Motorsports #9 car of Marcos Ambrose registering a time just 3/100ths of a second slower than Allmendinger. While Ford teams claims some important victories at Phoenix International Raceway (including the inaugural NASCAR Cup Series race by Alan Kulwicki in 1988 and Carl Edward's victory in last season's fall event), Chevrolet have won 13 of the 15 Phoenix Sprint Cup runnings. At the start of Sunday's Kobalt Tools 500, the top Chevrolet will be in 4th spot; the Hendrick Motorsports #5 machine driven by Mark Martin. Martin's fellow Hendrick Motorsports teammates are positioned in mid-field positions with Jimmie Johnson in 16th, Dale Earnhardt Jr starting 22nd and Jeff Gordon qualified in 23rd. Of the 12 race won by Chevrolet since 2003, 7 times it was a Hendrick Motorsports car stationed in victory lane. Wrapping up the top-10 qualifiers for the Kobalt Tools 500 at Phoenix International Raceway is Martin Truex Jr (the highest starting Toyota), Jamie McMurray, David Reutimann, title-contending Tony Stewart, Chase points leader Carl Edwards and Kasey Kahne. With Edwards and Stewart entering the Phoenix separated by just 3 points in the 2011 Chase points, one slight miscue by either driver could result in a drastic event as only the series finale Homestead-Miami Speedway round left after this race. Interesting notes heading into the resurfaced Phoenix International Raceway is neither Toyota or Dodge have recorded a Cup victory at the one-mile Arizona track. Also, the Phoenix race Sunday will be the first career Sprint Cup start with Camping World Truck Series rookie Cole Whitt driving a third Toyota Camry for Team Red Bull. 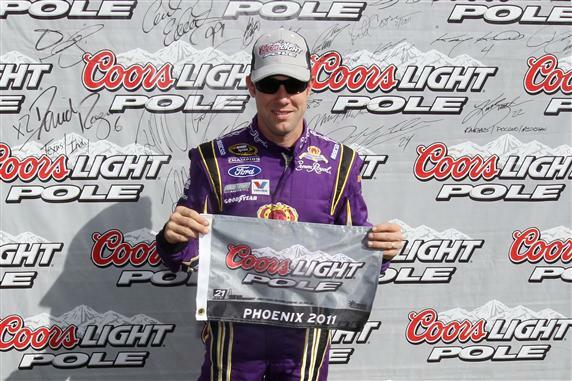 Scheduled for 312 laps, the 500-kilometer NASCAR Sprint Cup race at Phoenix is set for a 3pm Eastern time start.